Giacometti is organized by Megan Fontanella, Curator, Modern Art and Provenance, Solomon R. Guggenheim Museum, and Catherine Grenier, Director, Fondation Giacometti, Paris, with support provided by Mathilde Lecuyer-Maillé, Associate Curator, Fondation Giacometti, and Samantha Small, Curatorial Assistant, Solomon R. Guggenheim Museum. The exhibition underscores the historical relationship between the Guggenheim Museum and Giacometti. In 1955, in a temporary location, the Guggenheim organized the first-ever museum presentation of Giacometti’s work, which was also the earliest significant exhibition that the Guggenheim dedicated to sculpture. 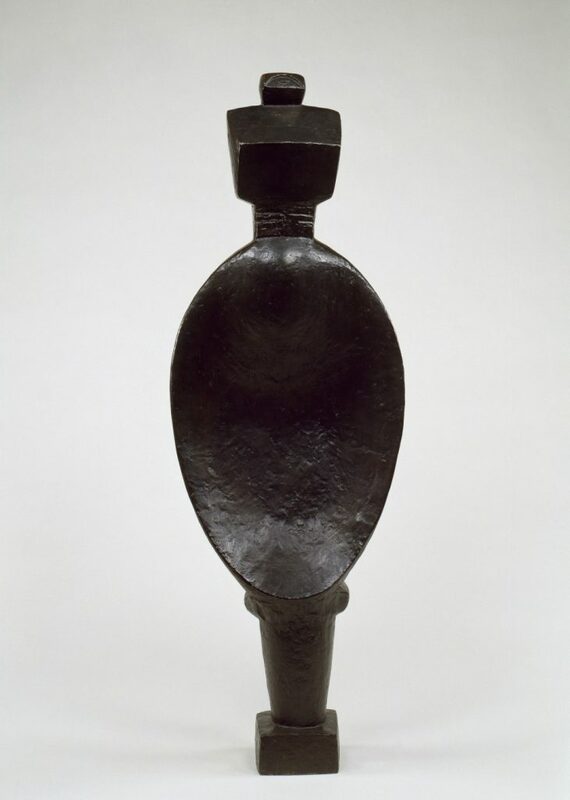 Under the leadership of then director James Johnson Sweeney, the museum brought key sculptures by Giacometti into its collection during this period in an effort to integrate the medium into its holdings and to support “the art of today.” In 1974, in the Frank Lloyd Wright-designed building, the Guggenheim organized a posthumous retrospective devoted to Giacometti. Beginning in the 1940s Peggy Guggenheim, Solomon’s niece, amassed Giacometti’s works along with examples of Surrealist and abstract art that would travel with her from New York to Europe and form the core of the Peggy Guggenheim Collection in Venice, now part of the Solomon R. Guggenheim Foundation. Visitors to this fresh presentation on Giacometti will have the opportunity to view works from across his career, which largely was spent in France and which spanned several decades and various mediums. Examples of his early production reveal his engagement with Cubism and Surrealism as well as African, Oceanic, and Cycladic art, and reflect interactions with writers including Jean-Paul Sartre and Samuel Beckett. The exhibition’s selection of Giacometti’s paintings and drawings demonstrates his attempt to capture the essence of humanity-an endeavor that is also apparent in his incessant sculptural investigations of the human body. Sculptures of various heights will be installed on pedestals in the round or set back into the museum’s walls. Displayed in vitrines, a number of pocket-size figures and heads created immediately before World War II explore spatial concerns of perspective and distance that would become paramount to his work. Giacometti’s studio practice, a particular focus of the exhibition, is shown through rarely exhibited plaster sculptures. The artist painted some of these works or later cast them in bronze, but others’ intended medium was plaster. Rich historical photographs and ephemera, such as journals and sketchbooks containing drawings, also provide insight into Giacometti’s process and document his artistic development. 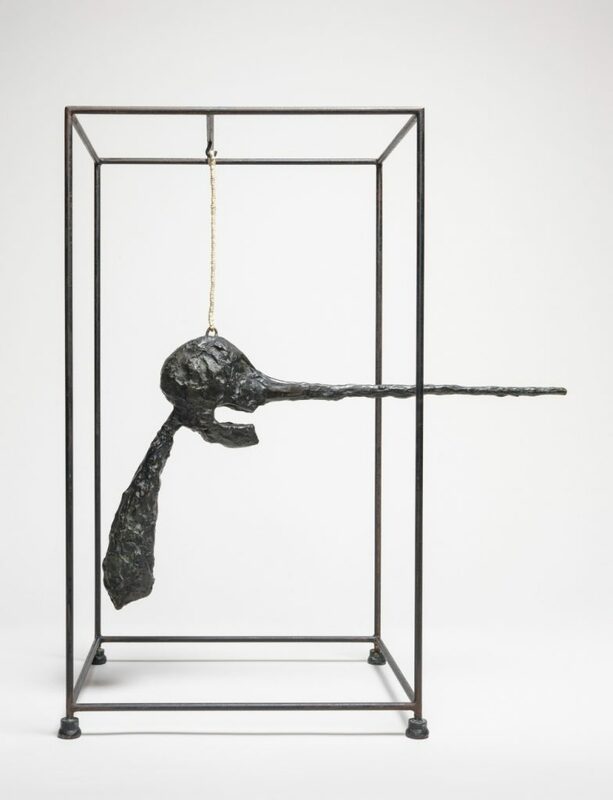 Giacometti features selections from the Fondation Giacometti and celebrated works from the Guggenheim collection, such as the bronze sculptures Spoon Woman (1926; cast 1954) and The Nose (1949; cast 1964). Loans from private and public collections further supplement the exhibition. Other highlights include a group of three sculptures from the late 1950s related to Giacometti’s unrealized project for the Chase Manhattan Bank plaza in New York, a major monument designed for an urban public space. Installed in the museum’s High Gallery, these large-scale works embody three motifs Giacometti explored during last 20 years of his life: standing female nudes, walking male figures, and bust-length portraits of family and friends. The final section of the exhibition, on the museum’s top ramp, presents footage from a film by Ernst Scheidegger, a friend of the artist, showing Giacometti at work in his longtime Paris studio.